Determining The Dispersion Characteristics And Tolerability Criteria For Gas Released From The Area On A Well Site. 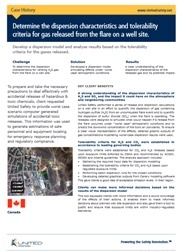 Home / Case OSIMS™ / Determining the dispersion characteristics and tolerability criteria for gas released from the area on a well site. Description: In order to determine the dispersion characteristics for venting H2S gas from the flare on a well site United Safety developed a dispersion model and analyzed results based on the tolerability criteria for the gases released. The end result was a clear understanding of the gas released and its potential impact.